Detailing the physical features, habits, territorial reach and other identifying qualities of the Giant Ichneumon Wasp: atrata. 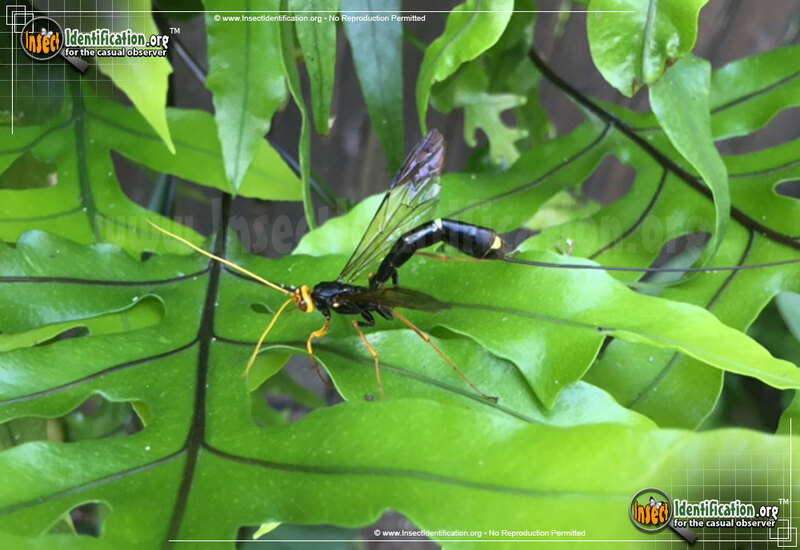 Long, lean bodies of Giant Ichneumon Wasps bespeak speed, but it's the thin, bendable, needle-like ovipositor of females that make most people worry. Wasps in the Megarhyssa genus are the largest Ichneumon wasps on the continent. There are four species in this genus and M. atrata is one of the more commonly spotted ones. Females have syringe-like ovipostors at the tip of the abdomen, which is often mistaken for a really long and threatening stinger. In truth, this ovipositor is used to lay eggs into the hard wood of tree trunks and the species does not sting people. Females try to discern where the eggs of Horntail Wasps were laid. Horntails are a shorter, robust wasp which also injects its fertilized eggs into tree trunks. It is unknown if the female follows existing cracks and holes to locate the host, or if she creates her own. The Megarhyssa atrata female places her own eggs near the Horntail eggs. 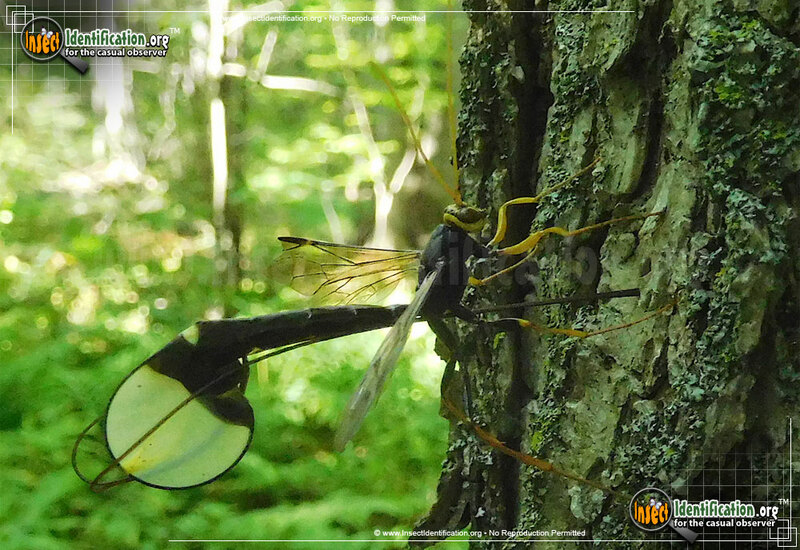 The Giant Ichneumon Wasp larvae will parasitize the Horntail larvae, feeding off them as they grow. They pupate inside the tree and chew their way out to the surface. Adult males are believed to be attracted to the chewing noises and may be seen waiting for females on a tree trunk as they emerge in order to immediately mate with her. Not all females are successful in transplanting eggs. Their large size and the egg-laying procedure make them vulnerable to predators like birds and raccoons. Sometimes, all that is left of a snatched female is her long ovipositor sticking out of the tree trunk, like a whisker. Look for M. atrata in woodlands and forests on tree trunks, especially those of dead or dying deciduous trees. They are active from spring through summer. While the larvae are known to be parasites of other wood-boring wasps, it is not known if adults feed.